Join us December 6-7th, 2016 at the Enercare Center in Toronto for the inaugural International UAV Show - Canada’s largest gathering of UAV professionals and enthusiasts. Setting the stage for what is to come in the future of UAV/UAS systems, this event will provide an all-encompassing view of the industry from the technology itself to the various applications, showcasing the immense value drones can bring to commercial businesses. The two-day event will be host to over 100 exhibitors, and headline numerous keynote speeches from industry experts and those who have profited most from the technology to date. Alongside presentations and live demos, attendees will be offered the opportunity to partake in a multitude of different workshops and interactive seminars, helping to measure the opportunity for UAV/UAS adoption and outline how to maximize the value drones can offer to various businesses. As a unique offering from other similar conferences, the International UAV Show will aim to highlight upcoming talent through hosting a number of Canada’s top post-secondary institutions for a two-day hackathon. Not only will this provide front line insight in to the fresh ideas of these young minds, but will serve as a valuable networking opportunity for top UAV firms to interact with some of Canada’s brightest up and coming talent. 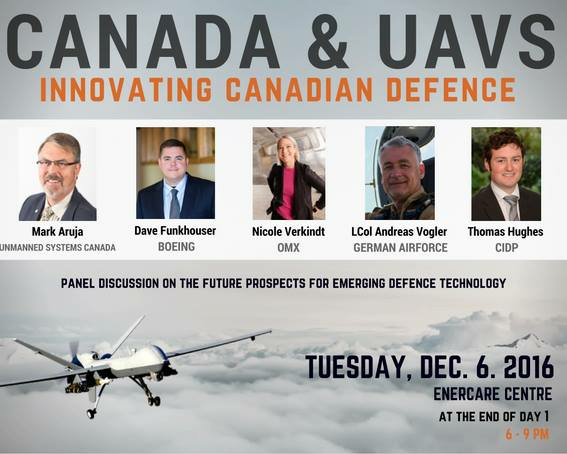 Join us after Day 1 events from 6:00 - 7:30 to hear industry experts from diverse professional backgrounds discuss how Canada is incorporating UAV technology into military capacities, and what this evolving technology might look like in the future. Panelists will include guests from OMX, Boeing, the Centre for International and Defence Policy, and Unmanned Systems Canada. The evening will conclude with a cocktail reception, where participants will be able to socialize and network with other industry leaders. To register for the event, click the link below. As International UAV Show Registrants receive a discounted ticket price of $25.00.